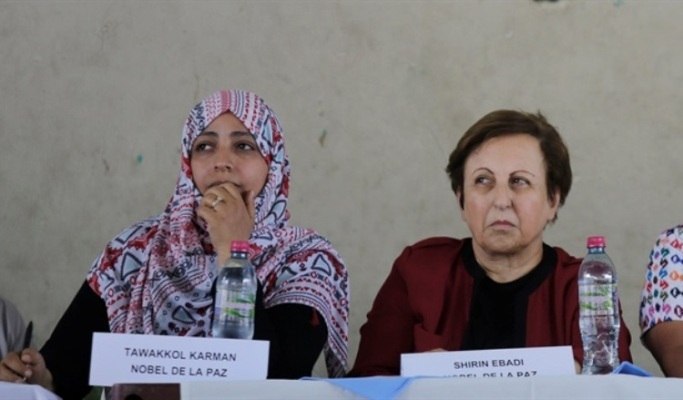 Nobel Peace Prize winners (L-R) Tawakkol Karman of Yemen, Shirin Ebadi of Iran. Nobel laureates Shirin Ebadi and Tawakkol Karman have termed the atrocities against Rohingyas in Myanmar’s Rakhine state as genocide. “The systematic use of the most brutal and dehumanising forms of violence that we witnessed in the Bangladesh camps should awaken us all to the fact that what is happening to the Rohingya has a name: It is genocide,” they said in a write-up published in Canadian newspaper ‘The Globe and Mail’ on Thursday. Myanmar authorities, including Canadian honorary citizen Aung San Suu Kyi, bear the ultimate responsibility to stop these atrocities, they wrote. “In late February this year, we travelled to the refugee camps of Kutupalong and Thyankhali in Bangladesh, to witness firsthand the persecution faced by the Rohingya people. Nothing could have prepared us for what we saw and heard,” they wrote. “More than 100 women told us how the Myanmar security forces burned villages, tortured, killed and systematically raped women and girls. An alarming majority of the women identified their perpetrators as members of the Myanmar military. Most of them were raped openly, in broad daylight, by men in military apparel, often just outside their home,” the noble laureate described. Impunity for these crimes and particularly for sexual violence is rampant in Myanmar, they said.